Quickway Buildings Ltd. began the supply of relocatable, prefabricated constructions in 1970 and as a testament to the quality of design and manufacture, many of the early buildings are still in use today, either in the original location, or having been sold on and relocated to new areas. Certain modifications to the design and changes in material specifications over the years have ensured that the buildings have kept pace with the changing requirements of building control offices, whilst the durability of the basic design concept has been maintained. 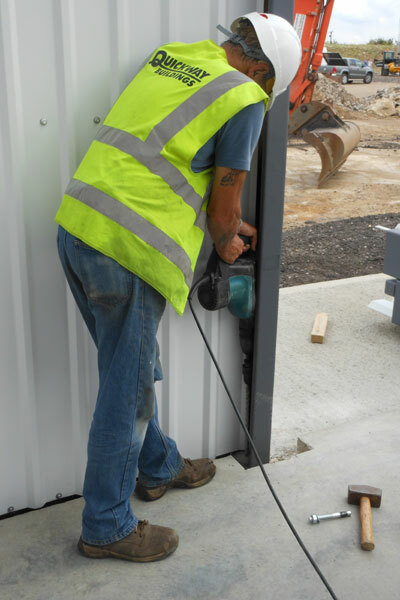 Quickway Buildings are manufactured using 100% British standard steel and have been designed to provide robust, durable structures which have the added benefit of being easily relocated and extended without the need to replace any of the major components due to the modular nature of their design. As the building panels are fully clad prior to leaving the factory, the buildings are also quickly erected, minimising disruption on site. Quickway Buildings are able to provide an economical modular building systems solution to a wide range of accommodation requirements and are designed in accordance with BS 5950. Specified by national, regional and independent companies throughout Britain, they have provided secure, visually attractive premises for use in many varied situations. As standard, seven different spans are available, from 7.32 metres wide to 24 metres, with a module width of 2.9 metres being constant throughout the range. Eaves heights vary from 3.66 metres for the smaller spans to six metres for the largest. Sliding main doors to a gable end, translucent roof panels, steel personnel doors and plastisol coated steel cladding in a wide range of colours are standard features, with roller shutter doors, windows, and side openings being optional extras. Ideally, the buildings require positioning on a concrete ring beam or concrete slab with a thickened edge beam, either of which can provide a permanent foundation within days. Transportation to the site is made via flatbed trailers, and erection is speedily undertaken by our experienced crew. Want to find out more about Quickway or talk to us about a new building? Please feel free to get in touch with us directly or via our contact form.